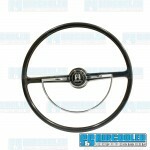 This is a great reproduction of the stock steering wheel with a metal reinforced ring. 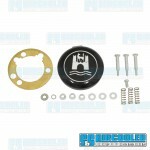 This is a reproduction of a stock 1966 design 15 3/4" steering wheel kit. It is supplied with the steering wheel, chrome half-moon horn ring, black and chrome center horn button with the crest emblem, and all necessary hardware.